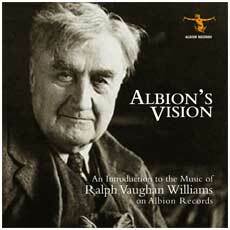 A compendium album/sampler introducing the music of Ralph Vaughan Williams. Throughout his career, and after his death, Vaughan Williams risked paying the price of insularity for his daring. Yet now, over forty* years since his death, his work is widely appreciated abroad, in America as well as in Europe, as it was in his lifetime. He is challenging Elgar’s hitherto unquestionable supremacy as the leading composer of the English musical renaissance.